The use of in-car networked electronic controller units (ECUs) for monitoring and control of various vehicle subsystems has become a common practice among the automotive manufacturers. In this chapter, the author surveys one of the most popular in-car networking technologies, the Controller Area Network (CAN), as well as newer and emerging in-car network technologies called FlexRay and Media-Oriented System Transport (MOST). Currently, these networks are deployed for in-car applications such as engine diagnostics, and infotainment systems. 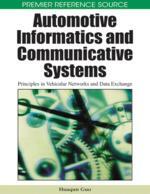 In this chapter, however, the author extends the use of these embedded vehicular networks by proposing to remotely monitor and control the vehicles through them, in order to realize safety and driver assistance related applications. To accomplish this task, additional technologies such as real-time wireless communications and data security are required, and each of them is introduced and described in this chapter.